When approaching the building via the access road an in-depth layered picture is discernible. The northeast side of the house is an addition, a combination of white cubes. Each of them is recognizable as an individual structure when viewed from close up, but seen from a distance, they merge to form a unified whole. The location on a steep south-facing slope required an access to the An der Achalm House from the public road running be¬low to the site situated about 12 metres higher. These conditions inspired the idea of embedding a mountain pass road into the site, which serves both as a drive and a footpath. The site is situated along a residential road with buildings primarily dating from the 1930s as it is typical for Stuttgart’s hillside locations. The residence relates to the down-to-earth quality and the scale of the neighbouring two-storey, cubic houses, but the façade facing the street is, owed to modern living requirements, mainly closed. An art loving couple was able to purchase an outstanding scenic property in the north of Stuttgart with spectacular views over the city. Vista House is reached via a southern access road situated below. While the garage, situated below the garden, is visible only through a wood-clad incision in the existing sandstone wall, the arriving is guided onto the property by a black concrete sculpture, a freely formed polished wall. A gently curved path leads via the east side to the entrance at the rear of the plot. 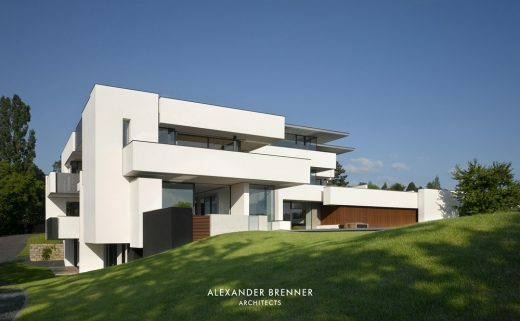 “The atelier of Alexander Brenner Architects was established in 1990 in Stuttgart, Germany. The atelier focuses on Villas and residential houses, art galleries and private art collections. The common ground for all projects is an integrated planning, which combines as well the building as the interior design, the elaboration of furnishings and fittings, the lighting design and all other specialist planning from one hand. This way all spatial issues are considered in such a way that a holistic structure can emerge that is thoroughly designed down to the smallest detail. Stephan Godel is the manufacturer of our special concrete for the research houses PR39 and PR41. Together with our construction-builder Horst Köhler we visited him in April 2016. May 2016 – I found my stone! For many years and especially at church and monastery walls I spotted a profound, bright, shining stone. origin. After a long search I finally discovered it in an abandoned quarry not too far away. The quarry seems to be closed down for a long time and indeed most of the year there is a heavenly peace over this place. But not every day, because the current owner of the quarry mines and recovers some blocks if needed and requested. What a fortune for us. July 8, 2016 in Architects.